If you have lost one or more teeth due to tooth fracture, failed root canal treatment, decay, infection, dry mouth, or periodontal (gum and bone) disease, there is an effective alternative that helps patients. Dental implants are giving people hope that were stuck with missing teeth, bridgework, partial dentures, or full dentures and are changing the way people live! They provide a foundation for replacement teeth that incredibly look, feel and function like natural teeth. The person who has lost a tooth or several teeth regains the ability to eat virtually anything without being bothered by seeds, nuts and other small hard foods. People with implant supported teeth can smile with confidence, knowing that teeth appear natural and that facial contours are improved. Implanted teeth preserve or improve facial structure and most importantly prevent the bone deterioration that occurs when teeth are missing. The people that have had dental implants can laugh without wondering if their denture will move out of place. Dental implants are tiny titanium posts, placed into the bone to replace the roots of missing teeth, providing a foundation for replacement teeth that are solid, stable and typically don’t have to be removed to clean them. A person who has lost teeth regains a great deal of self-confidence and typically says after the final teeth have been placed: “They feel as good as my natural teeth”. The bone bonds with the titanium closely (Osseointegration) which creates a strong foundation for the artificial teeth mounted to them. The teeth are attached to the implants using a small post that fits snugly into the dental implant and this post protrudes through the gum tissue. These posts provide a stable anchor for the artificial teeth to be attached to them. To be considered as a candidate for dental implants a thorough review of your health history is essential. Importantly also, we take the time with patients to find out what their needs, wants, desires, priorities and concerns are. These are ALL fully addressed before we proceed with dental implant therapy. After the review of your wants and health history, we do a thorough examination and then recommend whatever necessary x-rays are indicated to verify how much bone you have, where the bone is and how to get a successful result. We use a mini CT scan (Cone Beam Cat Scan or CBCT) which allows evaluation of a very small area with extremely low radiation. This helps us be sure the dental implants are placed in the best position for success, avoiding nerves and knowing the condition and location of your sinus cavity. After the examination and x-rays, we will discuss your choices with you. We typically offer 2-3 choices, because with modern implant dentistry and patients varied expectations, “one size does NOT fit all”. We discuss your preferred treatment plan and the associated fees, as well as your insurance and methods of payment at this time. There are many types of insurance plans and coverage for implants is varied. We will be happy to assist you in obtaining any benefits to which you may be entitled, filing your insurance claim for you as an added convenience. Dental implant placement is a minor outpatient surgical procedure, usually performed with some sedation or medication to reduce your anxiety. Our expectations of success and what dental implants will do for you is VERY high. We don’t take patients trust in us for this outpatient service lightly and regularly receive accolades from our patients about how well they were cared for. I have a team that is devoted to exceeding patients expectations, unconditionally. Routinely patients tell us that treatment was much easier than they expected. 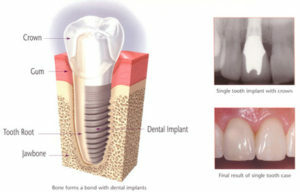 The cost of Dental Implants will vary, depending on the number of teeth requiring removal, the number of Implants needed, the amount of bone and soft tissue available, the esthetic requirements and the amount of bone needed to be regenerated, if any, to assure the implant is stable and strong. Typically before treatment patients are surprised at how much treatment fees are. Almost without exception, AFTER treatment, patients report that it was worth the investment and they wish they had done it sooner. We regularly treat people ages 18-90+ years old. Our Drs at South Valley Periodontics and Dental Implants and Woodland Hills Dentists are happy to answer any oral hygiene questions that you might have. Please feel free to call us at 818-225-9410 for more information or to schedule your periodontal disease screening today.